The Ranger Rundown: Can Nelson Cruz Play Major League Baseball? Can Nelson Cruz Play Major League Baseball? Acquired from Milwaukee as part of the Carlos Lee trade, Nelson Cruz provided scant evidence of being a Major League-caliber hitter in nearly 500 plate appearances during 2006-2007. Despite a another terrific season in AAA in 2007 (.352/.428/.698), he couldn’t crack the big-league roster this spring, and he then suffered the indignity of being unclaimed on waivers. Since then, he’s enjoying one of the most dominant AAA seasons in recent memory. Concurrent with Marlon Byrd continuing to bat 5th or 6th despite a line 247/.327/.384, calls for another chance in the Majors have amplified from a murmur to a dull roar. Can Nelson Cruz have a belatedly successful Major League career? Cruz turned 28 on July 1, although he’s classified as a 27-year-old in terms of the 2008 season. One method of answering this question is to compare him to other successful minor-league hitters in the same age group. We don’t want young, top prospects or greybeards. We’re looking at the guys on the fringe: failed/injured prospects and “never-weres” who suddenly erupted. Note: RC/G = Runs Created per Game, indicative of number of runs nine Nelson Cruz's would score. Which of these events is not like the others? Entering 1994, Dwayne Hosey was a thrice-released outfielder with just enough power and speed to secure continued employment, if only the itinerant kind. Despite seven years of experience, Hosey had logged only 32 games in AAA before his career-best outburst. Still, Hosey found himself in Omaha again in 1995. He was batting .295/.363/.535 with 12 homers and 15 steals when the Red Sox selected him off waivers on August 31. Injected into the starting lineup almost immediately, Hosey batted .338/.408/.618 in September and stole the starting CF job from Lee Tinsley (who was batting a respectable-for-the-position .284/.359/.402). On the evening of October 3, Hosey found himself in the batter’s box for the first pitch of the ALDS against Cleveland’s Dennis Martinez. Hosey went 0-12 with two walks in the series. Boston traded Tinsley in the offseason, seemingly insuring everyday play for Hosey, but injuries and ineffectiveness (.218/.282/.333) soon forced him back to the minors. The man who led off the ALDS in 1995 would play his last MLB game only eight months later. Franklin was a 3rd-round selection (90th overall) by the Mets, who released him after two lackluster seasons in short-season leagues. Franklin hit 51 homers during the next two years, becoming enough of a prospect to warrant a late 1994 trade to Pittsburgh for Brian Hunter (the slow guy with some power, not the speed demon). Franklin was claimed off waivers by Detroit in 1995 and traded to traded to St. Louis in 1996. Entering 1997, he’d hit 94 homers in the previous four years. He finally got a taste of the Majors that May and batted .324/.378/.500 in 27 plate appearances. It wasn’t enough to stick, and the Cardinals released him even before the season ended. In 1998, at the age of 26 and with his 5th organization, Franklin had his career year. Chicago nevertheless declined to add him to its 40-man roster. Rather than hope for another chance to be a 5th outfielder somewhere, Franklin moved to Japan and batted .238/.348/.502 with 23 homers for the Nippon Ham Fighters in 1999. He appears to have suffered an injury plagued season in 2000, and in 2001 he returned to the US. After three more modestly successful seasons among four teams, he was done at the age of 32. As a 21-year-old in 1998, Pickering batted .309/.425/.566 with 31 homers for AA Bowie. Nevertheless, the Orioles traded for 33-year-old Jeff Conine to man first and retained 40-year-old Harold Baines as the DH. Injuries and perhaps discouragement led to two lackluster seasons in AAA. During a third and better AAA campaign in 2001, Baltimore waived him, and division-rival Boston placed the winning claim. Another injury prevented Pickering from taking the field with the Red Sox. He spent 2003 with the Mariners (cut in Spring Training), a Mexican team, and Cincinnati (cut after the season). As an Omaha Royal in 2004, Pickering produced one of the best power surges in recent years, hitting 35 homers in 92 games and slugging .712. He received his first lengthy trial in the Majors and batted .246/.338/.500 with another seven homers in 35 games. Come 2005, Pickering was shipped back to Omaha after just seven games (.148/.226/.259). The Royals gave most of their 1B at-bats to 37-year-old Matt Stairs. Not that Stairs was a bad player, but the Royals were dead last in the AL homers and lost 102 games. If Pickering were a total bust, then the Royals lose… 105? So what. The Royals also bestowed significant playing time to the likes of Joe McEwing, Denny Hocking, and especially Terrence Long. Just a stupidly, stupidly assembled and operated club. Anyway… Pickering batted .275/.384/.528 with another 23 homers in Omaha. He spent 2006 in Korea and has logged some time in the independent leagues lately. 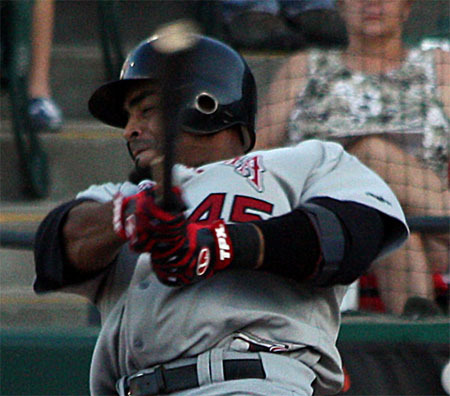 Drafted 57th overall in 2001, McPherson quickly established himself as a premier hitting talent. McPherson batted .310/.401/.596 between high-A and AA as a 22-year-old, after which Baseball America ranked him the 33rd best prospect in baseball. He topped himself in 2004, blasting 40 homers and slugging .670, and jumped to 12th on BA’s list. Still, even with Anaheim 3B Troy Glaus frequently injured, McPherson didn’t receive more than a brief look in the Majors. With Glaus gone in 2005, McPherson had a full-time gig but couldn’t take advantage. His walk-strikeout ratio had decayed as he climbed the minors, and in Anaheim it collapsed. That and injuries limited him to 101 games and a .296 on-base percentage through 2006. He missed the entire 2007 season with back problems, and the Angels non-tendered him last December. McPherson signed with the Marlins, but new injuries prevented him from making the club. Now healthy and in the extremely hitter-friendly environment of Albuquerque, McPherson is presently battling Nelson Cruz for the most homers in professional baseball. Too bad Florida doesn’t have a DH. His 32% strikeout rate and good-but-not-great-for-Albq .294 average call into question whether he’ll make enough contact to succeed in the Majors, but he’ll definitely get another chance. Crespo was drafted 95th overall in 1991 by the Blue Jays as a 2B with good contact and OBP skills. Crespo advanced to AAA by 1995 and played in 34 games for Toronto during 1996-1997. Of the ten players with seasons most similar to Nelson Cruz, Crespo is one of only three to spend an entire season in the Majors (the others are Brian Daubach and Lee Stevens). Unfortunately for Crespo, he’d switched nearly full time to the outfield and had no chance of supplanting Toronto’s young and spry trio of Shannon Stewart, Jose Cruz Jr., and Shawn Green (this was 1998, remember). Crespo had 153 plate appearances in 66 games and batted .262/.342/.362, admirable considering the often lengthy gaps between at-bats. Toronto released Crespo during 1999’s Spring Training. As a 26-year-old Fresno Grizzly, he inexplicably thumped 24 homers and slugged .616. He previous bests were 13 and .493. In 2000, he again lasted an entire year in the Majors as an infrequently used 1B/OF, batting .290/.351/.443. In 2001, he abruptly stopped making contact, perhaps party due to plantar fasciitis. Crespo fluttered through Philadelphia, Japan’s Yomuiri, and AAA Louisville before retiring at Age 31 in 2004. The list improves for Nelson Cruz at this point. Brian Daubach and Lee Stevens both had a respectable stretch of 4-5 years after their breakout AAA seasons. Petagine was Big In Japan for five years, Fernandez for three. Dillon’s one season with Yomuiri was a disaster. 31. Jon Knott, 2006, Age 27 . Truly a mixed bag. Cruz’s 2008 compares favorably to a couple of guys who earned some MLB coin (Stevens and Daubach), several players who’ve succeeded at advanced ages for various reasons (Luke Scott, Rick Ankiel, Jack Cust), a contemporary hoping for another chance (McPherson)… and no fewer than two dozen AAAA All-Stars. On the other hand, we’ve been down this road. As mentioned, Cruz hit the cover off the ball for the Redhawks in 2007, and he has a career minor-league line of .298/.368/.540. Cruz’s administrative status is also a huge hurdle. Traded or not, he can declare free agency if not placed on a 40-man roster after the season. Texas, or someone, will have to make a real commitment. Despite his amazing season, I’m skeptical that anyone will. Come 2009, Cruz may find himself in a new team’s Spring training facility on a minor-league deal. Or Japan.